Telah dibaca oleh: 104 orang. It’s like a mechanical bull ride. I’m tilting side to side trying to master this rented moped. The roads are uneven, I’m embarrassingly inexperienced, and the sun is setting. If it wasn’t for the warming smile of my guide and the desire to feel a part of this serene island landscape on Lombok, I’d be chasing down a taxi for a safer, more comfortable ride. We’ve been held up at a junction by the most colourful peak hour traffic jam I’ve ever encountered. A wedding procession of over 500 cheering, smiling people who hang from the side of trucks roll on past like a carnival float. Even the taxi drivers caught up in it all with their horse carts, alongside other locals also held up, refusing to sound a horn of irritation. They’re smiling, at times waving to the crowd. The whole hectic scene epitomises this emphatic, unique and at times far-out culture which is so dearly treasured by the people of Lombok. A culture which has been mixed and matched, and adapted with the times – a place like no other. Lombok is an island set to accommodate all, and its indigenous “Sasak people”, who make up 70% of the population, have proudly adapted their culture to fit with the changing times. 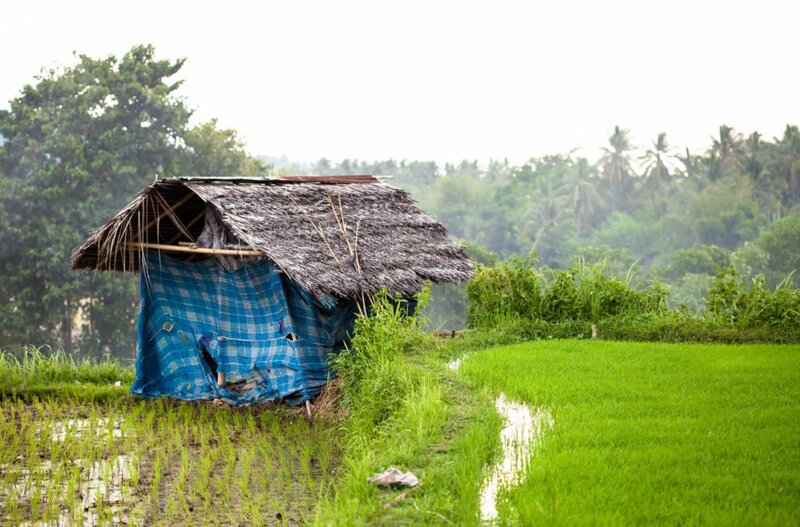 Islam, the island’s main religion, has been mingled with elements of traditional aspects of Balinese Hinduism, and certain village infrastructures have swayed from the traditional wooden Sasak Lumbungs (rice barns made from sundried mud and buffalo dung). These subtle changes have blended many cultures into one and given the island that unique edge. Throughout it all you can see the Sasak way of life rhythmically operating along the roadside; on a bike you have to be careful to avoid women drying rice on carpets and underfed cows loosely tied to trees. This 3.5 million population, at times, appears to be all in one village. 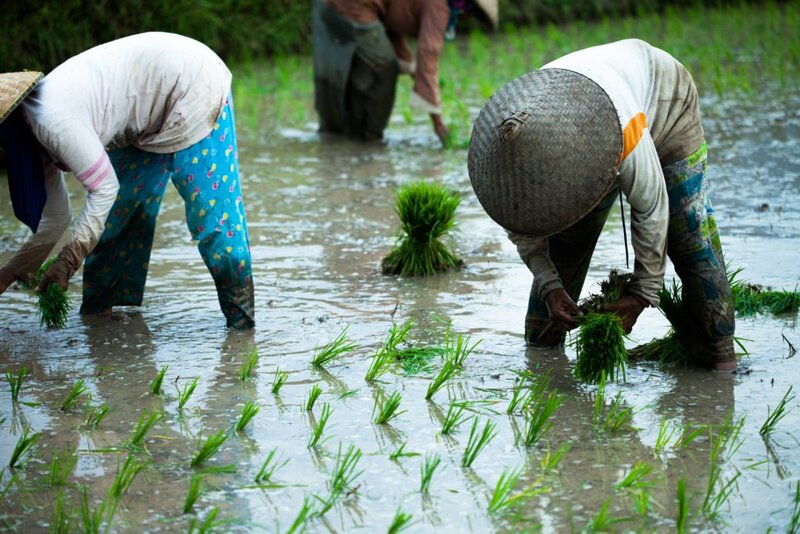 Look one way, and all you can see is the conical hats of farmers — knee-deep in water — spending a lifetime parenting their crops. Look the other, and a scooter-packed fuel station selling petrol by the vodka bottle is being urinated on by an island dog. It is beautifully disorganised. But it’s a religion that is unique to this island. Wetu Telu, a blend of Islam, Hinduism, and indigenous animal beliefs, has remained with the Sasak people and has altered throughout their history, incorporating parts of other beliefs into one over time. It’s centred around Islam, but with a few differences — typically, locals don’t pray five times a day and they only observe three days of fasting during Ramadan. 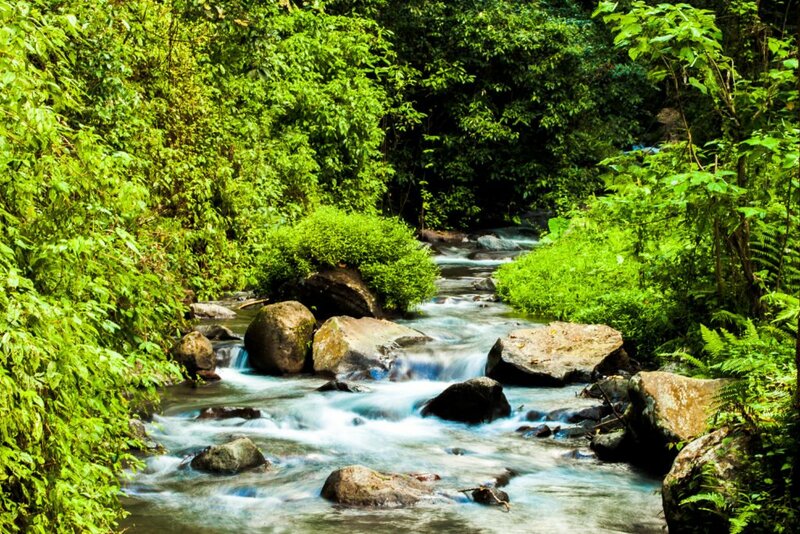 Still, there are also some who believe in supernatural powers that supposedly dwell in the clear springs within the mountains; take a visit to the Tiu Kelep waterfall on the side of Gunung Rinjani, the island’s tallest mountain, and you’ll be sure to hear rumours of the water’s magical qualities. Our waterfall guide, Joe O’Benks explained that some of the locals believe that the water makes people more youthful. 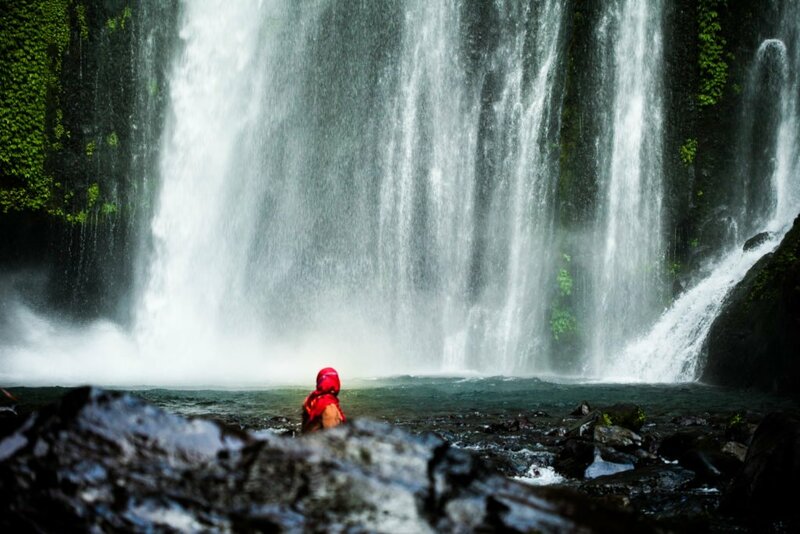 A fragmented tale of a young prince hiding below the waterfall to outsmart a lion has created a legend that frequent visitors of the spot love to recite. Many locals live by the waterfalls, using the water to bathe or to drink, and some choose the cooling pools as an ideal hideaway from the afternoon humidity. To the Sasak people, Rinjani and its surrounding waters capture the spirit of the island. 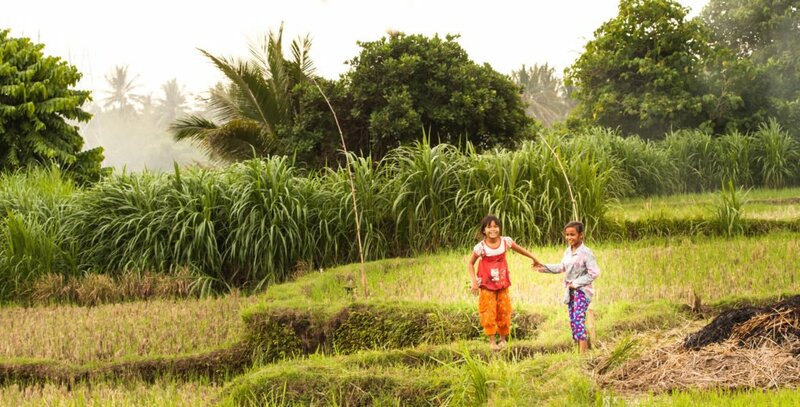 A clear adoration for nature is ever present when talking to the locals, who are quick to recommend catching the rainbow that casts above the Tiu Kelep crest in the early morning, or who go out of their way to pick out litter from the fast-flowing streams. These natural places of beauty that they are so keen to promote and protect are often the same settings they choose to hold gatherings at with friends and family. A such, walking along the sunset beaches in the evening unfolds a scene of open greenery full of people busy in conversation, talking over picnics and barbecues. 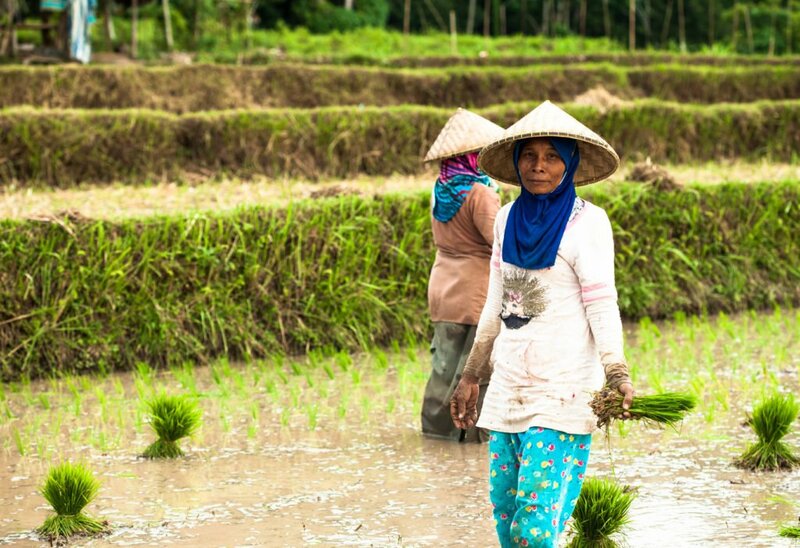 During the day, taking a walk through the rice paddies, or scooting along the mud roads, you see groups of women together. The definition of symbiosis. Hand in hand, smile with smile, you feel a part of this great feeling of intimate togetherness that seems so absent from the modernised outer world. While in Lombok, one tends to forget about that world. “Men are mostly king of the household,” Nurida explains, “they wake up after the woman, and she has to prepare everything for the man.” Women appear to work the laborious jobs; whether that is on the farms or maintaining the household. For the women, these long hours and hands-on jobs are seen as fundamental to the island’s survival. 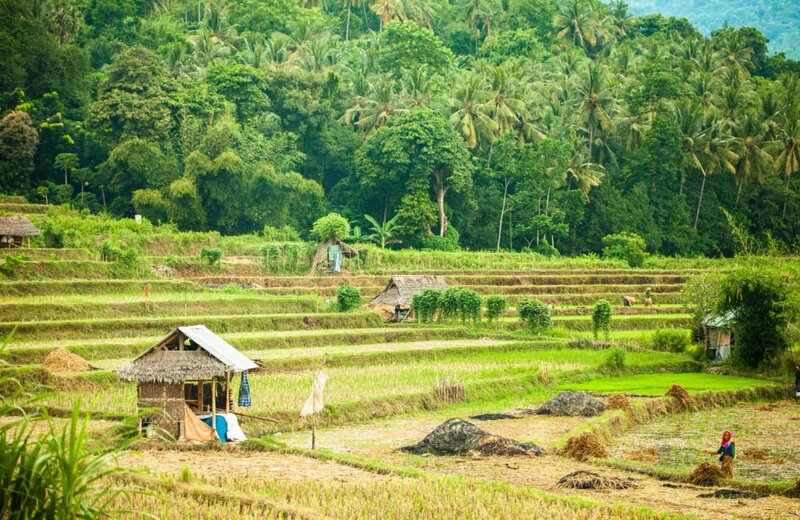 Lombok relies on its rice; the locals have it with every meal. Everywhere you look you see flooded paddies squeezed into the most unlikely of places. The “would be” garden space of houses along the roadside are traded in to provide room to grow crop, and are filled with people knee-deep in the muddy pools constantly probing their produce. It’s a busy day, and farmers work tirelessly from seven to four in the afternoon. While journeying around, you’ll notice that the fields are constantly being tended to. Different people are doing different jobs to maintain the farm, all within a small area, but everyone is ready to stop for a conversation, or to wave. As they test the English words that they have learnt on you, they’ll also let out an infectious laugh when you try to reply. The children remain curious, following us at a distance through the intertwining dirt paths that border off each paddy; and every time we turn back to wave at them, they giggle. Lombok. It’s an island like no other, and for those seeking a taste of a unique island culture; through food, people and untouched nature — then it is a place to consider. Still happily holding onto its traditions, the island and its inhabitants are a world apart from their sister islands of Bali and the backpacker haven of Gili Trawangan. The social, honest and beautifully offbeat Sasak people here are truly unforgettable. Oliver Jarvis is the Online editor and in-house writer for Scuba Diver magazines. He currently resides in Singapore, where he is adapting to a culture which is far different from his simple British roots! Click here to visit my website.